Sciatica is a pain symptom that some people experience in the buttocks or radiating down the legs. It can be experienced as a sharp pain, numbness, or as a “pins and needles” sensation in the legs. For some it may be merely an annoyance when sitting for long periods of time. For others it can be a devastating and debilitating pain that is relentless. The discomfort or pain often is made worse by many ordinary daily activities, such as sitting, coughing, sneezing, driving, or straining to lift. We need to keep in mind that it can also be a sign of something much more serious. “True” sciatica is usually diagnosed when a person’s pain reaches below the level of one or both knees. Herniated or bulging discs. This is the most common form of severe sciatica and is the most difficult to deal with and treat. Chiropractic care is often helpful for this. Spinal subluxation. This is a spinal vertebra that has lost its proper position and is causing a “pinched nerve” effect. It is spinal subluxations in the lower lumbar region that can cause sciatica. Chiropractic treatment of sciatica involves relieving spinal subluxation. Muscle spasm. There are times when the sciatica can be caused by the “piriformis” muscle pinching the sciatic nerve. This may be the least dangerous form. Other causes may include advanced degenerative arthritis leading to spurs or spinal stenosis. Spondylolisthesis can also cause sciatica as it usually occurs in the low back in the area of the distribution of the sciatic nerve. 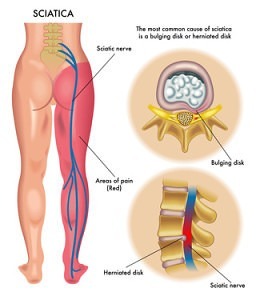 Sitting for long periods may aggravate the sciatic nerve since it passes through the buttocks. This is especially true in very thin people unless the sitting pain is caused by disc aggravation. Can a Chiropractor Help with or Treat Sciatica Pain? Medical doctors tend to treat sciatica with medicines such as muscle relaxers, pain relievers, cortisone injection, and surgery. While these may be helpful in a certain number of cases, they typically do not correct the actual problem. In fact, these approaches often present new complicating problems of their own through persistent side effects, and after effects. Once surgery is performed, there is no return to “normal” function. It is impossible due to the nature of surgery. On the other hand, more natural approaches, such as chiropractic care, specific exercise, and careful stretches, are often very helpful because the offer a more natural approach that facilitates and encourages the body’s own innate healing process. With very few exceptions, we always recommend first trying conservative approaches and allow them time to heal the body before pursuing risky and permanent medical procedures. Chiropractic care for sciatica is based on restoring normal function to the spine and spinal joints using chiropractic adjustments. Chiropractic adjustments for sciatica help by taking pressure off the sciatic nerves and discs. Chiropractic for sciatica helps by restoring natural movement and function to the spine, this allows the discs to stay hydrated and healthy. Restoring natural function, relieving pressure on the nerves, and enhancing the natural healing ability of the body is the goal of chiropractic care for sciatica. The sciatic nerve is one big nerve, in fact, it is the largest nerve in the body. It is different in that it is actually composed of several spinal nerves from the lower lumbar spine to the upper to middle sacrum all coming together in the low back! Because of this, the chiropractic treatment of sciatica with adjustments involves determining which nerve is impinged. The chiropractor will evaluate the best way to adjust so the chiropractor can help with sciatica and get the pressure off the nerve. Home care might involve use of ice and/or specific movements or exercises designed to gently restore health to the lower spine. Also, I always stress to my patients: never use heat on any pain in the body that radiates. Dealing with life’s stresses can also be helpful. It is proven that onset of low back pain and disorders can be related to periods of elevated life stress. Some patients may need to lose weight in order to relieve pressure on the back joints and discs. Or they may need to proactively face and resolve a chronic or acute problem that is causing physical, mental, or emotional stress. Chiropractic treatment for sciatica can be very effective if used properly. Chiropractic care, home care, and healthy choices are all a part of a natural approach to healing this sometimes severe nerve problem. If you are experiencing any of the symptoms associated with sciatica, it is advised that you seek a professional evaluation. Our office has years of experience in helping people with radiating nerve problems and would be honored to meet with you to see if we can help. Feel free to contact our office with any questions you may have. If you’re seeking chiropractic treatment for sciatica pain, call us today at 828-298-0011 so we can help.